If you would like to learn more about Science & Arts Academy, please fill out our online inquiry form. Upon filling out this form, a member of our admissions team will follow up with you to share more information about SAA and answer any questions you may have. One of the best ways to truly appreciate all we have to offer is by visiting our school. School tours are offered on a regular basis, and can be scheduled online or by giving us a call. All tours are private, allowing us to personalize the visit to your individual needs. During a tour, you will have the opportunity to visit classrooms, speak with teachers, and see students across multiple grade levels engaged in differentiated learning activities. You will also meet with a member of our admissions team to learn more about our school and the application process. Open House events are offered annually in November and January. During the November Open House, you will have an opportunity to hear from the Head of School, tour the school, meet teachers, and ask questions of current SAA parents, students, and alumni. The January Open House will be a unique, interactive experience, allowing students the opportunity to take part in sample lessons, while allowing parents the opportunity to observe these lessons. To RSVP for an event, please click here. Administration of the Wechsler Preschool and Primary Scale of Intelligence (WPPSI) or the Wechsler Intelligence Scale for Children (WISC) is required as a part of the application process for students entering kindergarten through eighth grade. (IQ testing is not required for entry into the Junior Kindergarten program). The IQ test serves as a helpful measure of a child’s cognitive ability and potential. Children with a full scale IQ score of 125 or above are considered for admission to SAA. 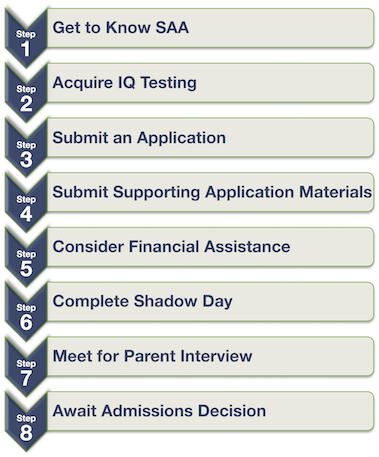 Please keep in mind that IQ testing is only one component of the application process, as we consider all aspects of the applicant’s qualifications when making admissions decisions. A complete evaluation report is required, which includes a full-scale IQ score, sub-test scores, evaluator commentary, and recommendations for educational programming and special services, if needed. Testing must be completed by a licensed psychologist. Please click here for a list of psychologists that often provide services to families seeking enrollment in Science & Arts Academy. We will, however, accept evaluations from any licensed psychologist, even if they are not included on the attached list. Applications are currently being accepted for the 2019-20 school year on a rolling basis, as seats remain available. Please click here to access the online application. Complete all fields in this online application, and submit along with a $75 non-refundable application fee. All materials should be scanned and uploaded electronically into the online application. We urge you not to let the cost of tuition stand in the way of considering SAA for your gifted child(ren). Our need based scholarship program enables us to assist deserving students who could not otherwise afford to attend our school. If you would like to apply for a need based scholarship, you will be required to complete an online application through FACTS, a need analysis provider. The cost for a need based scholarship application is $35. The need based scholarship application is separate from the application for admission, although it should be completed concurrently with the admissions process. Applying for a need-based scholarship does not influence the admission decision. After submitting all application materials, students are invited to experience a day at Science & Arts Academy. During a Shadow Day, your child will be assigned to a homeroom equivalent to his/her current grade level. Students will have an opportunity to attend various classes, meet other children and teachers, and absorb first-hand what it would be like to attend SAA. A parent interview is required as a part of the admissions process. The purpose of this meeting is to help us better understand your child, and help you better understand Science & Arts Academy, so that we work together to determine if SAA is the best match for your child’s education. Parent interviews are typically scheduled on the same day as the child’s Shadow Visit, but can be scheduled at other times as requested.